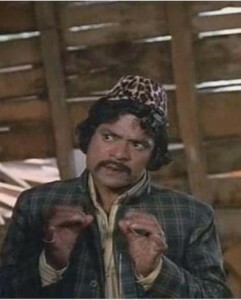 People keep asking about the real ‘Soorma Bhopali’ who inspired the ‘Sholay’ character. Well, his real name was Nahar Singh. A man, who once characterised the social milieu of Bhopal. The late Nahar Singh, also addressed as ‘Mama’ and ‘Soorma Bhopali’, was a contemporary of writer-poet Javed Akhter (part of the Salim-Javed team that scripted Sholay) in Bhopal’s Saifia College. That was in mid-1960s. By that time, Soorma Bhopali was already known to most of old Bhopal. Javed was also known in the social and literary circles because of his parents – poet Jan Nisar Akhter and writer Safia. Javed, who often slept in a room of Saifia College by pulling together two benches (have you read his poem ‘Woh kamra yaad aata hai’? ), saw Nahar Singh from close quarters and enjoyed his sharp wit and his delightful company. But the reel character portrayed in Sholay a few years later had no resemblance with the real personality of Nahar Singh, except his sobriquet. Nahar Singh was of medium height, dark hued, very witty and large-hearted person with a couldn’t-care-less attitude towards life. He invariably wore dark glasses and a golf cap. His sense of humour and his repartee made him popular; what made him earn respect and love was that he was always prepared to help friends facing any problem. Actually, he was always ready to intercede physically for friends and this perhaps earned him the sobriquet of ‘Soorma Bhopali’. No wonder, because he was named ‘Nahar’ (lion). But he had a special love for his alma mater Saifia College. At that time, the college had a very strong hockey team that challenged the might of many a formidable team in various tournaments. ‘Mama’, who was a municipal employee, accompanied the team wherever it went as its unofficial cheerleader. He even picked up players from their homes on his way to railway station. He was always prepared to jump into the field whenever he felt umpires had done ‘injustice’ to the team or when the opposing team played rough. (When it came to a scrappy encounter, inflicting a bleeding injury on shins, knees and wrists through deft stick-work, which even the umpires could not see, was called ‘phool khila diya’ – made a flower bloom. Mama even shared the team’s accommodation and sometimes bore his travel expenses himself. Former president of the Bhopal Hockey Association, Prof Rafat Mohammed Khan, himself a national player who represented Bhopal and Saifia College, has written that Nahar Singh’s many qualities included his deep spirituality. Whenever he saw lying on ground a wrapper of Ganesh Bidi (with a image of lord Ganesha printed on it), he would pick it up, direct a couple of profanities towards the irreverent smoker, and pocketed the wrapper to later dispose it off respectfully. Khan wrote that once Saifia College was playing in Scindia Gold Cup at Gwalior. Olympian Inam-ur-Rehman was at his peak and unstoppable. The match was against a local team of Gwalior. It was an intense fight. Suddenly, someone from the stands shouted, “Pakistani hai! Maro!’ In a flash, an infuriated Nahar Singh was in front of the stand, shouting, “You are a Mahasabhayee (of Hindu Mahasabha)! No Muslim in my Bhopal can dare treat a Hindu player like this! Come on, come on! I can take you on! I am Soorma Bhopali!” and then he broke down. Gwalior Superintendent of Police Kailash Saxena, who hailed from Bhopal, pacified Mama with great difficulty. When Sholay was released, Nahar Singh went to the court, alleging he had been defamed. The case was settled out of court though it created quite a sensation in the town. One night in 1979, he went to Bhadbhada check-post of BMC to drop a colleague on his scooter. While returning, a truck knocked down his scooter. Soorma Bhopali died and with him died a part of essential Bhopali character. outstanding piece, mamu. wish we had a picture of the real one too for quick recall. do keep writing. wonderful to know about the actual man behind `Surma Bhopali` term…. channels have robbed that love and affection between people.That culture is dead.In place of green playing fields we have grown concrete jungle.Every house have became a cage where everyone is living his own life.Who have time to appreciate good for all people like surma.Sorry there is no surmas today. it is quite wonderful to know about the real ‘Soorma Bhopali’. now days it has become hard to see any bhopali with similar accent. Nasir Sir thanks for bringing such a good character here. Never suspected that there actually could be a real person with the sobriquet ‘Soorma Bhopali.’ The character created by Salim-Javed was so quintessentially Bhopali that the possibility never occurs. Thanks for this little piece of a very interesting info! And the write-up is as delightful as one would expect from Nasir Kamaal. Please write an article on Bhopali Patiyebaaz. मैं १९७३ से १९७८, १९८० से १९८६ और २००२ से २००४ भोपाल में पोस्ट रहा.अपने पहले कार्यकाल में मैं मंगलवारा/इतवारा क्षेत्र में रहा और भोपाली कल्चर को करीब से देखने का मौका मिला.मैं समझता हूँ जावेद भाई ने बहुत खूबसूरती से सूरमा भोपाली के चरित्र रचा है. केरेक्टराइजेशन वही लोकप्रिय साबित होता है जो लोगों को अपनी मिट्टी से जोड़ पाए और सूरमा भोपाली की भूमिका में जावेद साहब ने उसी भोपाली मिट्टी के रंग भरे हैं. शोले फिल्म और उसके विभिन्न चरित्र तो ऐतिहासिक हैं ही सूरमा भोपाली को भी लेखक ने अमर कर दिया है.